Jessica Breland calls out a play to teammates. Maria Noble/WomensHoopsWorld. 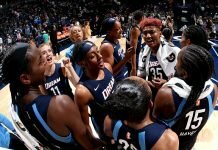 Early this month, things weren’t so bright for the Atlanta Dream. With a new head coach and only four returning players, the team had shown flashes of promise to start. But just after the Fourth of July they had fallen on hard times, losing five of their last seven games. They were eighth in league standings and seemed poised to drop out of playoff contention. 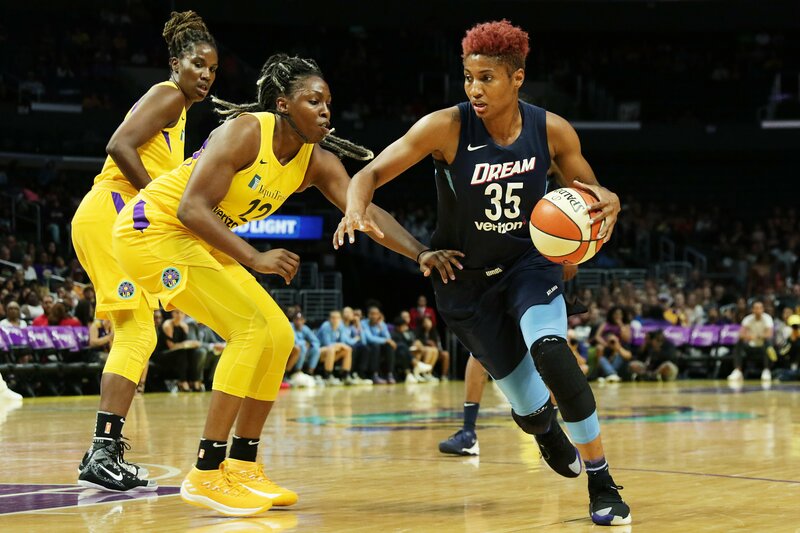 Then that Sunday the Dream got out to a hot start against the Phoenix Mercury, held off their rally and beat them by six points with a balanced scoring effort. They have not looked back since. Atlanta broke the franchise record for most consecutive wins last weekend, earning their seventh against the No. 1 Seattle Storm. 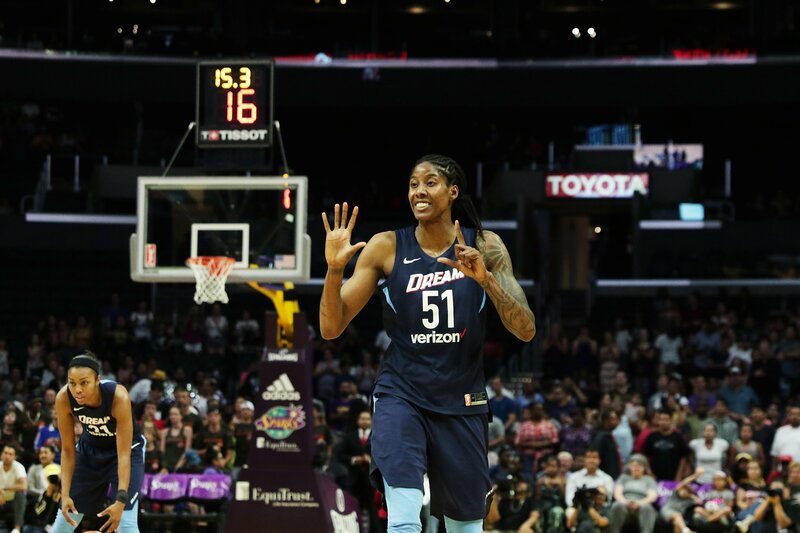 Two nights later in Los Angeles, they surprised the Sparks by pulling away late to take a 10-point victory. The Dream’s eight-game winning streak going into the All-Star break gives them a 16-9 record for the third time in franchise history, and puts them in second place, 2.5 games behind Seattle and one game ahead of the Minnesota Lynx. But just as important as their improving record is the way Atlanta has been winning: with solid contributions from both starters and reserves, and with true team basketball. The on-court cohesion of athletes is palatable, and the ball movement, often beautiful. 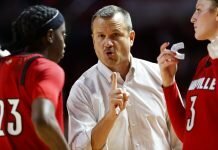 As a result, players are using words that haven’t been heard much in their locker room the last several years. 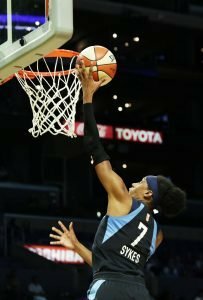 Angel McCoughtry drives around the Sparks defense. Maria Noble/WomensHoopsWorld. 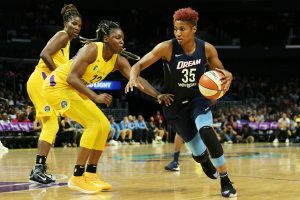 All-Star veteran forward Angel McCoughtry, who opted to sit out last year and was convinced by Collen to return this season, said both she and her teammates work to improve daily. Collen was hired last October. 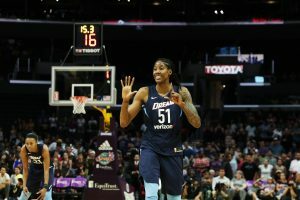 In February the franchise signed veterans Renee Montgomery and Jessica Breland, and Elizabeth Williams signed a multi-year contract extension. Returnees from last season also included top scorer Tiffany Hayes, dynamic guard Sykes, Damiris Dantas, Imani McGee-Stafford and Layshia Clarendon. Other newcomers included second-round draft pick Monique Billings, Blake Dietrick and Alexis Prince. Just after they began their wining streak, the Dream traded Clarendon to the Sun for Alex Bentley, who played for the team in 2013. Atlanta has not missed a beat, and neither has Bentley, who has been a reliable bench scorer and a good fit with the roster. The possibility of earning a title seemed a long shot at the beginning of the season, with not only so many newcomers but parity looming in the league, after the infusion of an outstanding draft class. But Collen’s creation has fit together better – and more quickly – than anyone expected. Renee Montgomery sizes up the court against the Sun. Chris Poss Photo. Overall statistics from last year, when Atlanta went 12-22 after a nine-game losing streak and missed the playoffs, and this season are similar. What is different is player statistical distribution. This year sees each person on the roster scoring more on average, rather than just a few starters putting up big points. In 2017 Clarendon had 6.6 assists per game and Hayes, 2.4, while no one else on the team averaged over 1.9. This season there are five Dream players who average 2 assists per game or higher. This is because the team moves the ball fluidly, scores in transition and plays tough defense. Breland said the group banded together when they fully understood what they had. The team unity extends off the court, as players joke with each other a lot, dance together during warm ups and are mutually supportive. Yet, despite the sometimes outrageous humor that players often post on social media, Sykes said they know when to reel it in and tend to business. “We have a lot of clowns on this team, as you can see. But everybody knows what they need to do and need not to do; everybody knows their role, and we know when to be focused,” Sykes said. Brittney Sykes elevates to score. Maria Noble/WomensHoopsWorld. Players are quick to credit Collen not just for being the architect of a good team, but in preparing them to face opponents. Last weekend the Dream took a red-eye flight to the West Coast the same day they had beaten Seattle, and Collen watched game video the entire time. 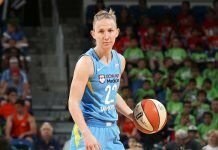 Collen said she has to be ready, as the WNBA’s size and level of play leaves no room for error. Collen was a Division I assistant coach for nine years before coming to the WNBA, where she spent two seasons working for Connecticut Sun coach Curt Miller. She has surprised those who didn’t know much about her, and her optimism inspires the team. 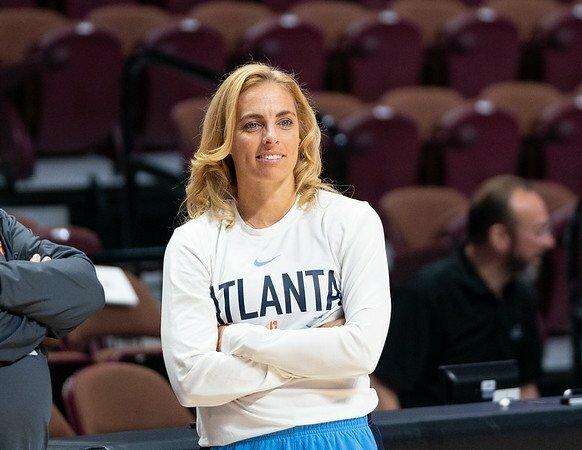 Atlanta Dream coach Nicki Collen has guided her team to an eight-game winning streak this month. Chris Poss Photo. 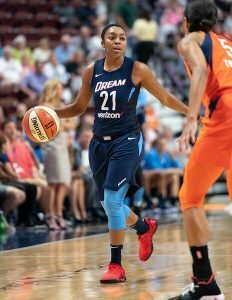 In 2017 the Dream returned from All-Star break and went on their long losing streak. This year that kind of season re-start doesn’t look probable, due to their deep bench and work ethic. 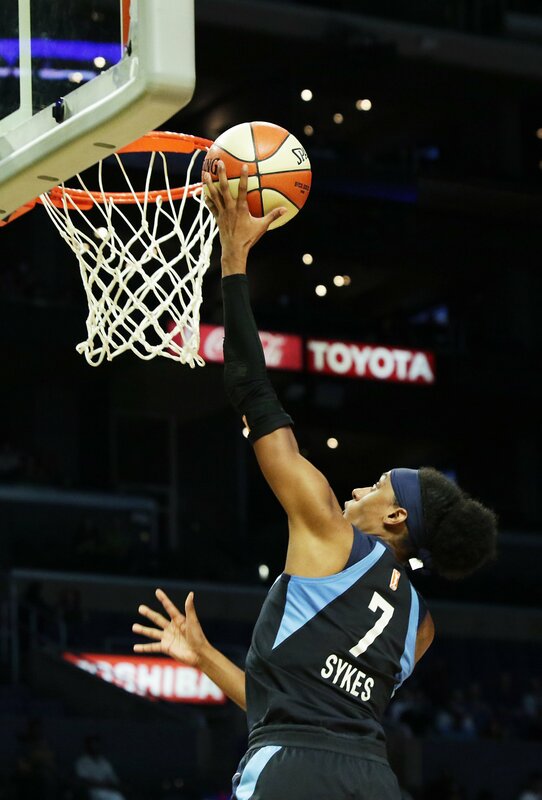 Sykes, who stepped up in McCoughtry’s absence as a rookie, now happily leads the reserves like a veteran and brings tremendous energy to the court. Like other great teams, Atlanta players all say they focus on one game at a time. Collen gives them constant feedback, and they don’t underestimate any opponent. To do that, the Dream focuses on taking small steps, and keeping their overall goals in mind. Montgomery is already looking forward to reconvening after the break. “I hope we stay sick with it,” she said with a smile.